of a lovely young woman and her family on Christmas day in French Guiana. TERRY BROCKBANK (Henri Trochard) is delighted to be making his debut at HTC! He most recently played the title role in BOTTOMS UP–THE PRIVATE LIVES OF NOEL COWARD at Northeast Stage, where he has also played King Duncan and the Scottish Doctor in MACBETH. 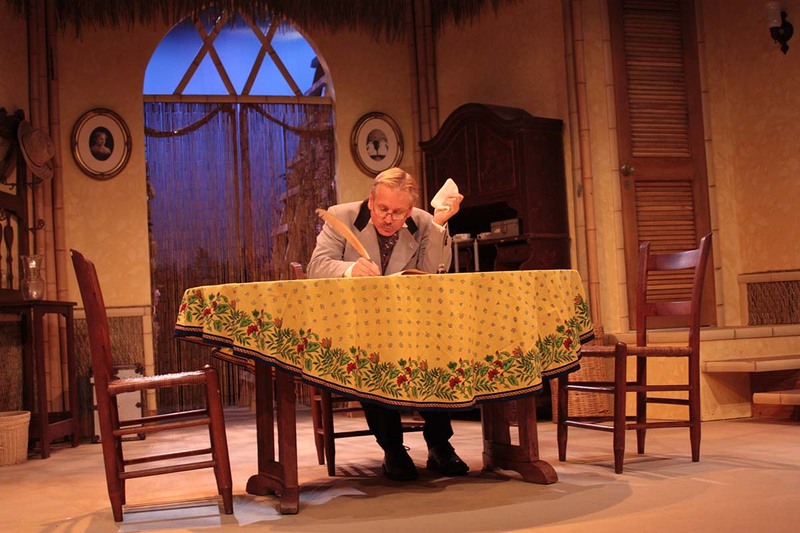 At the NFCT, he played Colonel Pickering in MY FAIR LADY and Frank Doel in 84 CHARING CROSS ROAD. Terry has also performed in community theater and dinner theater in Wales, Virginia, and NYC, where roles include Cliff in LOOK BACK IN ANGER, Horatio in HAMLET, Mr. Mulleady in THE HOSTAGE, and The Judge in VOLPONE. He is also a director with a long string of credits. Recently retired, Terry now shares his time between homes in New York City and Shelter Island. 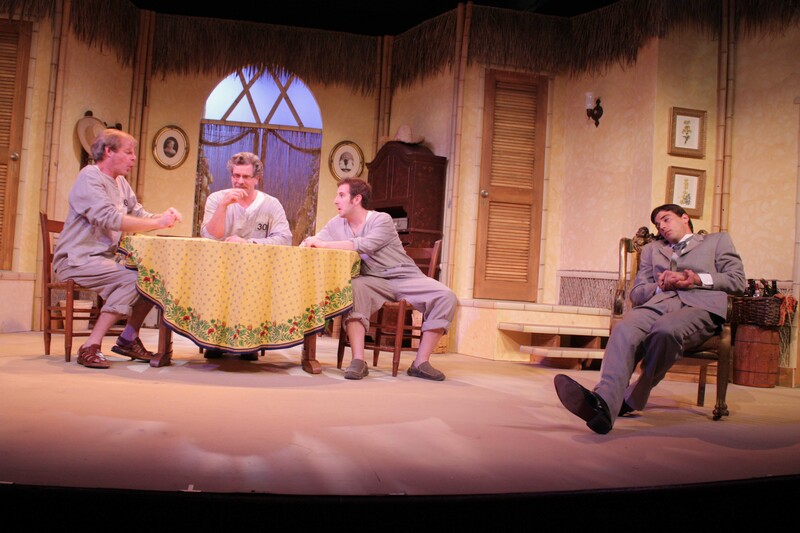 TOM BYRN (Jules) is making his Hampton Theatre Company debut. Recently, he appeared in HE AND SHE at East Lynne Theater in Cape May, NJ, and directed THE LIVING NEWSPAPER, a new play with music about the WPA Federal Theater for Mad River Theater in Ohio. He has worked with many Philadelphia and New York area theater companies, including People’s Light & Theatre, Act II Playhouse, InterAct Theatre, Bristol Valley Theatre, and Cider Mill Playhouse. For 11 years, he was an ensemble member at the Bloomsburg Theatre Ensemble in Bloomsburg, PA. He is a coeditor of Letters to the Editor: 200 Years in the Life of an American Town, published by Simon & Schuster. Tom is a Long Island native and is happy to be returning “home” to work. Thanks to Sarah and Hampton Theatre Company for the opportunity! TYLER GARDELLA (Paul) attended Interlochen Arts Academy and graduated from Ithaca College with a BFA in acting. His past credits include: MACBETH (Banquo) with the Ithaca Shakespeare Company, THE EXONERATED, MUCH ADO ABOUT NOTHING, TOUCH, and THE RECEPTIONIST. 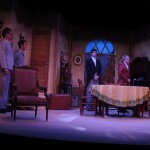 This is his first role with the Hampton Theatre Company, and he is thankful for the warm welcome by Sarah and the cast. He would also like to thank his loving and ever-supportive family. EMILY KARPIUK (Marie Louise Ducotel) is pursuing her passion to perform in NYC, though she is proud to be from “Tree Town,” Ann Arbor, MI. She is a recent graduate of the Boston Conservatory, with a BFA in Musical Theater. Emily has sailed the seas as a featured singer with Royal Caribbean International, and toured the US and performed in NYC with Brother Joscephus and The Love Revival Revolution Orchestra. Emily interned at the Looking Glass Theatre, and has performed in the new works THE LIFE AND DEATH OF JOSHUA ZWEIG and BLASPHEME. Emily is thrilled to be working on her first production with the Hampton Theatre Company. 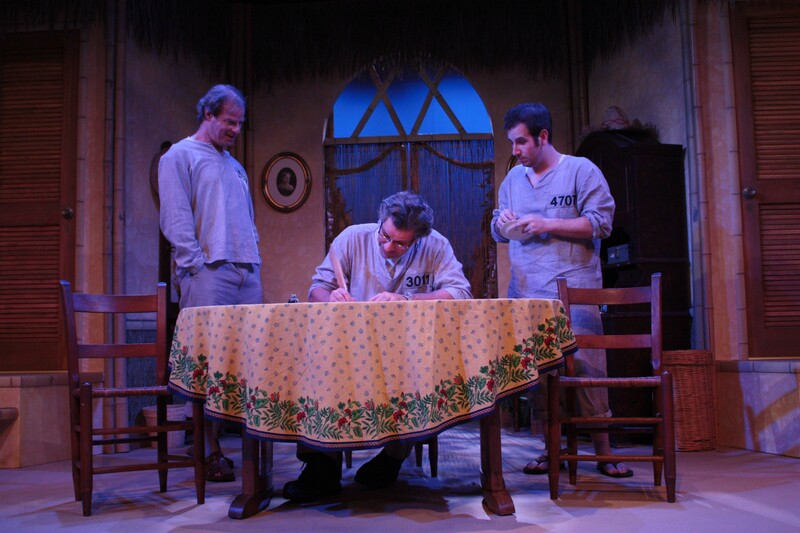 EDWARD KASSAR (Joseph) played Gary in HTC’s production of I HATE HAMLET as well as Richard in DESPERATE AFFECTION, Mike Talman in WAIT UNTIL DARK, Ricky Roma in GLENGARRY GLEN ROSS, Mike in BREAKING LEGS, Lennie in OF MICE AND MEN, and Limping Man in FUDDY MEERS. Other theatrical credits include THE ZOO STORY, ART, MISERY, HURLYBURLY, GOOSE AND TOMTOM, A STREETCAR NAMED DESIRE, SAME TIME NEXT YEAR, BURIED CHILD, NOT ABOUT NIGHTINGALES, THE NERD, JOE TURNER’S COME AND GONE, THE BALCONY and LA RONDE. Film credits include Unlikely Prophets, Dying for Dollars, Overdrive, Mook, Sushi Bar, Mulligan Farm, Down Clown, Nine Out of Ten, If I Only Knew and Scallop Pond. Thanks to Mom, Dad, Cara, family and friends for their support. 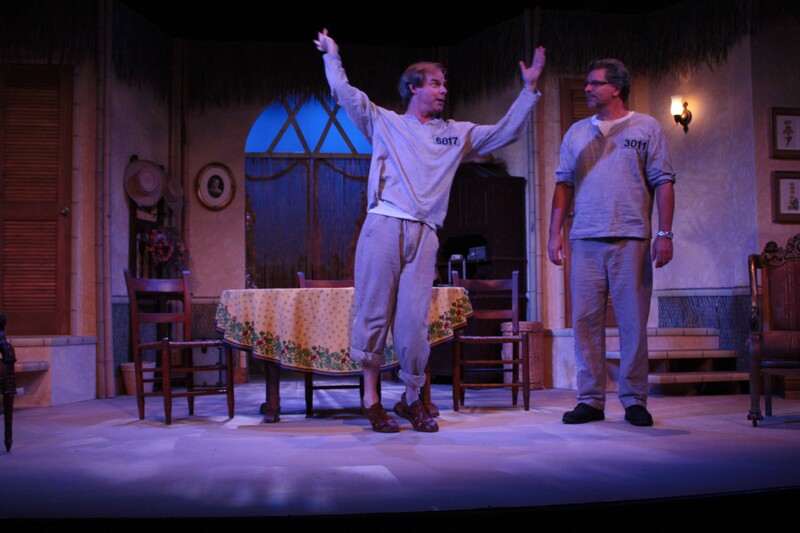 BEN LEASURE (Lieutenant) is proud to portray the Lieutenant in this beautiful play, his first in Quogue. A NYC based actor, Ben has appeared in several short films, a comedic web series, Heroes and Monsters, and his first feature film, Men With Arms, starring Ben as Lloyd, which is now in post-production. He has appeared regionally in Marvin Cheiten’s ZENOBIA, and in NYC in CECILE, TWELFTH NIGHT, SORRY ABOUT YOUR PENPAL, and THE DAVID IVES ZONE, among others. A ‘thank you’ to Sarah and the HTC for the opportunity, to my love Joy for her support and to my family for being unmatchable. 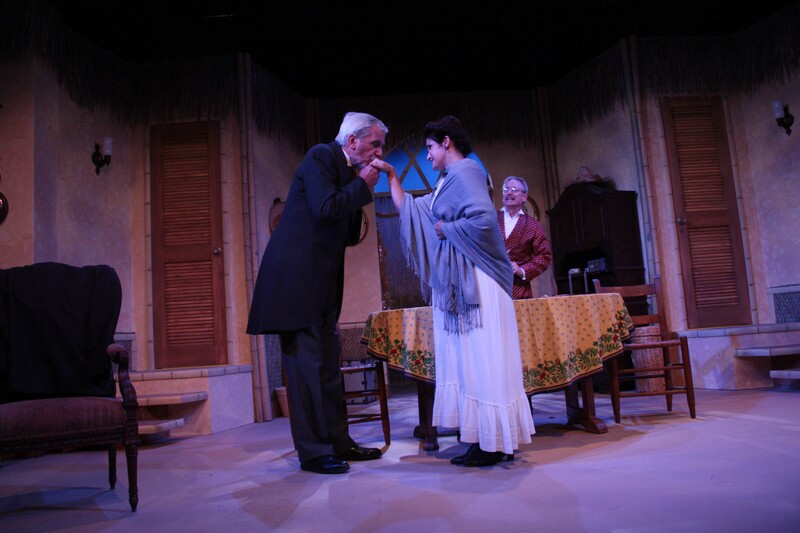 CATHERINE MALONEY (Emilie Ducotel) is thrilled to make her first Hampton Theatre Company appearance! 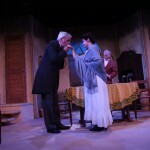 Past performances include Masha in THE THREE SISTERS, directed by Peg Murray at NFCT, and Marie in INCORRUPTIBLE. A fellow Hamptonite, Catherine is active in the community, while her greatest joy is being a mother. DIANA MARBURY (Mme. 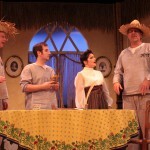 Parole, Producer, Set Decor) is pleased to tread the boards with such a talented cast. Diana directed ‘ART’ last winter, and was seen most recently as Mrs. Fisher in THE ENCHANTED APRIL, as Lillian Troy in I HATE HAMLET and as Nat in RABBIT HOLE. She is the Artistic Director of the HTC and has worn many hats over the years. She would like to thank all the “behind the scenes” people who make these productions possible. She would particularly like to thank her son Sean for bringing his gifts to the company table. 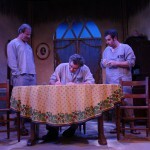 NICK MASSON (Alfred) played Rick in the HTC’s production of SIX DEGREES OF SEPARATION. He recently participated in the New York Fringe Festival in the World Premier of WILHELMSTRASSE, as well as performing in LITTLE WOMEN (John Brooke), RING OF FIRE and STORIES OF MOUNTAIN RAILROADS for Greenbrier Valley Theatre in West Virginia. A native New Yorker, he received his BA from The College of Santa Fe. 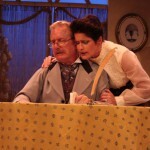 He has been fortunate to work all over the country in numerous regional and touring productions. Nick’s favorite role is the title character in WAITING FOR GODOT. With love for my Boodge, the cows, Mom, Joe and “the back row!” Proud member of AEA. BLAKE WALTON (Felix Ducotel) is pleased to be making his Hampton Theatre Company debut. He returned to New York three years ago after working in Los Angeles, Chicago and Florida. His career began at the Neighborhood Playhouse School where he studied with Bill Esper and Sandy Meisner, then originated roles in new plays and musicals including Mark in Doric Wilson’s historic, ground-breaking production of THE WEST STREET GANG. He has starred in the musicals INTO THE WOODS, STOP THE WORLD, ANYTHING GOES, FORUM, SWEENY TODD, I DO, I DO!, CITY OF ANGELS, and plays JEFFREY, SNAKEBIT, KISS OF THE SPIDER WOMAN, DIRTY BLONDE, THE SUM OF US, DON’T DRESS FOR DINNER, and as screen star Bette Davis at 77 in ME & JEZEBEL. Also a director, writer and acting coach and a proud member of AEA, he is honored to be the father of singer/songwriter Huck Walton. SAM AND BELLA SPEWAK (Playwrights) were a writing team best known for the book to the musical KISS ME, KATE, while their most successful straight play was MY THREE ANGELS, which ran on Broadway in 1953 and was later made into the movie We’re No Angels. Other Broadway credits include BOY MEETS GIRL, TWO BLIND MICE and ONCE THERE WAS A RUSSIAN. SARAH HUNNEWELL (Director/Producer) wears many hats for the company, but is happiest in her directorial one. Favorites include THE ENCHANTED APRIL, RABBIT HOLE, ONE FLEW OVER THE CUCKOO’S NEST, THE OLDEST LIVING GRADUATE, EVERYTHING IN THE GARDEN, FUDDY MEERS, PROOF, SUMMER AND SMOKE, THE RAINMAKER, and A VIEW FROM THE BRIDGE. Many thanks to her talented cast and crew for bringing this charming play to life and to our wonderful angels and audience members for making our work possible. 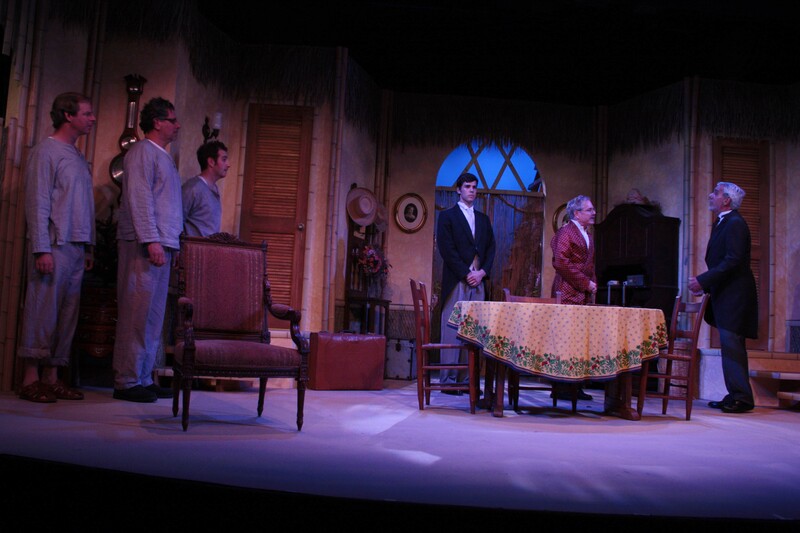 Thanks to Jimmy, Sean, Diana and all the team for our beautiful set and to Nancy, John, Terry, Blair, Andrew, Lulie and Ann Marie for hosting our out-of-town actors. 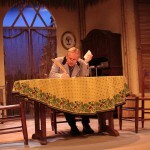 JAMES EWING (Set Design) founded the HTC in 1984 and has since appeared in over 20 productions and built numerous sets. Special gratitude has to be expressed to his reliable and skilled production team all listed in the program. And of course to Sarah for her wise guidance and fortitude as we stumble along in these efforts. JEAN PLITT (Stage Manager). 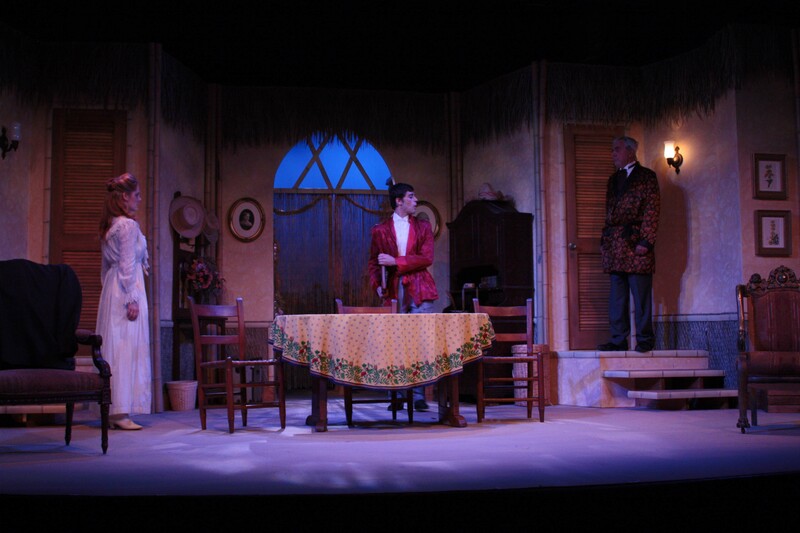 It is a pleasure to work with the talented people who perform or are involved in the production of each show presented by the Hampton Theatre Company. From auditions to opening night, the process of bringing the “page to the stage” requires the creative energies of all involved, and I am very happy to be part of it. 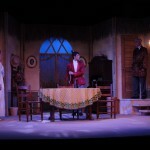 Congratulations to the cast and crew of MY THREE ANGELS! ROB DOWLING (Lighting & Sound Technician) has done lighting and sound for 20 years at the North Fork Community Theater, Vail-Leavitt Music Hall, Producer’s Club (NYC), the Loft Theater at Dowling College and the Southampton Cultural Center. 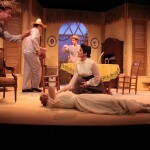 He has also helped Sebastian with lighting set up at Guild Hall, the Ross School, and other local venues. “Many thanks, Sebastian!” This is Rob’s sixth season with the Hampton Theatre Company. He is very happy to be part of the show and the company. This past weekend in Quogue, murder was on the minds of several dozen people gathered at the Community Hall. And it will be again this weekend, and the one after that too. 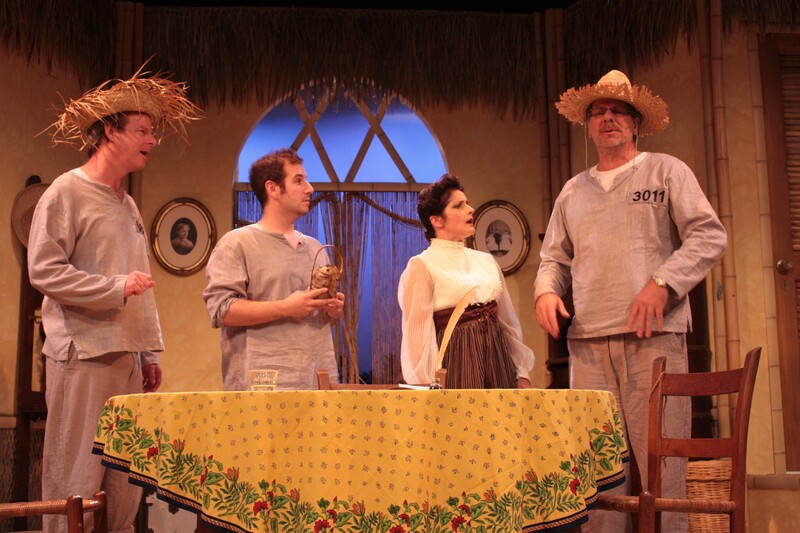 Set in Cayenne, French Guiana, on Christmas Eve in 1910, the play, written by Sam and Bella Spewak, features the Ducotel family—comely Marie Louise, her no-nonsense but kindhearted mother, Emilie, and her hopelessly hapless father, Felix—and three lovable convicts who manage to save the day for their hosts. Each of the Ducotels are in a bit of a crisis: Marie Louis, played by the lovely Emily Karpiuk (and though she sang just one short lyric, it was immediately apparent that this woman has a beautiful voice), is about to lose the man she loves, and her parents, played ably by Catherine Maloney and Blake Walton, are on the cusp of financial ruin. Their fates lie in the hands of the miserly and mean-spirited bully, Henri Trochard, played with enthusiastic gusto by Terry Brockbank. 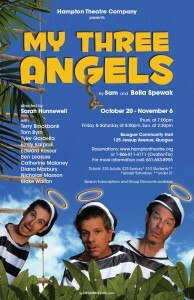 Enter the three convicts/angels, lovable scoundrels who manage to solve all of the Ducotel family’s problems overnight. As the title indicates, these guys are the real stars of the show. 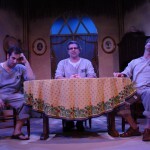 There’s Joseph, played by the charming Edward Kassar, a thieving felon who could sell ice cubes to Eskimos; Jules, played to the hilt by Tom Byrn, a murderer who strangled his cheating wife (“I wasn’t born in a cell, but I wasn’t sent here for biting my fingernails either.”); and Alfred, played pitch perfectly by Nick Masson, a lovestruck romantic who also just happens to be a particularly violent murderer. Despite the fact that these three are convicted felons, the audience, and the other players on the stage, has no choice but to root for them. They, after all, are the good guys. A couple of people get killed, no matter, they got what was coming to them anyway. 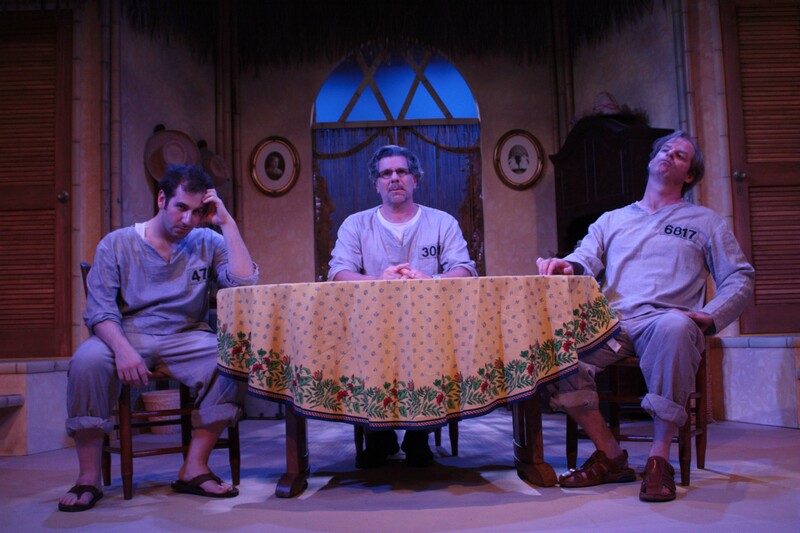 A play such as “My Three Angels” depends on a few things: the charm of the convicts, the repugnance of the villain, and the stabilizing force of the other major players—all basically straight men who provide the backdrop for the action. 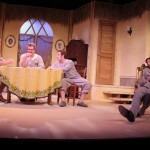 In this production, directed by Sarah Hunnewell, the Hampton Theatre Company team hits all marks with its usual aplomb. There was not a weak link in the company, but standout scene stealers for this reviewer were Mr. Byrn and Mr. Kassar. Mr. Byrn’s portrayal of Jules was deftly funny and his over-the-top mugging was quite winsome. 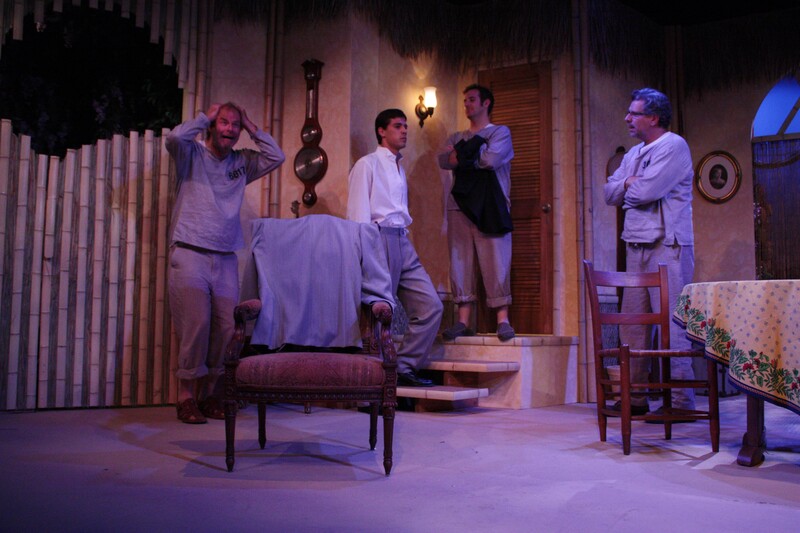 Mr. Kassar’s approach to the smooth con man Joseph was filled with guile, intelligence and appeal. And though she had a bit part, Diana Marbury, certainly at home on the stage, commanded instant and immediate attention for the brief moments she appeared as Mme. Parole, wringing every bit of character out of her character. Kudos are also in order for the other major players—Ms. Karpiuk, Mr. Walton and Ms. Maloney, who all did fine jobs—and to the rest of the supporting cast—Mr. Brockbank, who really gave his all playing the cantankerous Henri, Tyler Gardella as the handsome but spineless Paul, or Ben Leasure, who made the most of his very short time on stage as the Lieutenant. 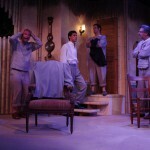 It’s impossible to talk about the Hampton Theatre Company without mentioning the sets, which are always beautifully crafted. Compliments to James Ewing, Diana Marbury, Sebastian Paczynski, and the rest of the crew responsible for the look and feel of “My Three Angels.” And Teresa Lebrun’s costume design was spot on. 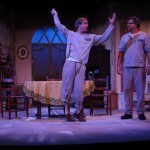 Bottom Line: A fun and entertaining show with lots of bright spots in the cast and on the stage. 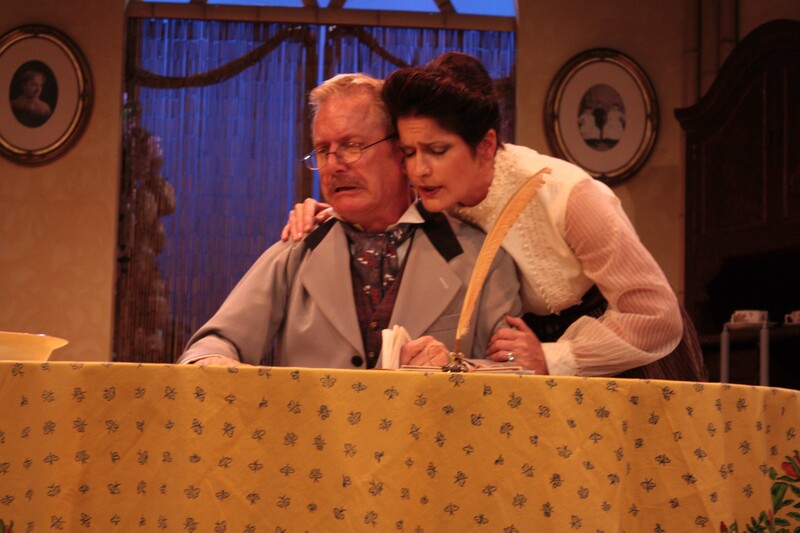 The quaintly amusing “My Three Angels,” the ’50s play and movie (“We’re No Angels”), takes us back to a less ambiguous time in director Sarah Hunnewell’s handsome Hampton Theatre Company revival. Three convicts employed by a good-hearted but inept shopkeeper rescue his family at Christmastime. Two are convicted murderers: played by Tom Byrn and Nick Masson; the third (Edward Kassar), a swindler. Each makes the case for supposed evil overcoming coldhearted rectitude. The shopkeeper’s cousin (Terry Brockbank) is about to ruin the family. His nephew (Tyler Gardella) will break a heart. As the shopkeeping spouses, Blake Walton and Catherine Maloney are believably incapable of dissembling. Equally disarming is Emily Karpiuk as their hopelessly romantic daughter. 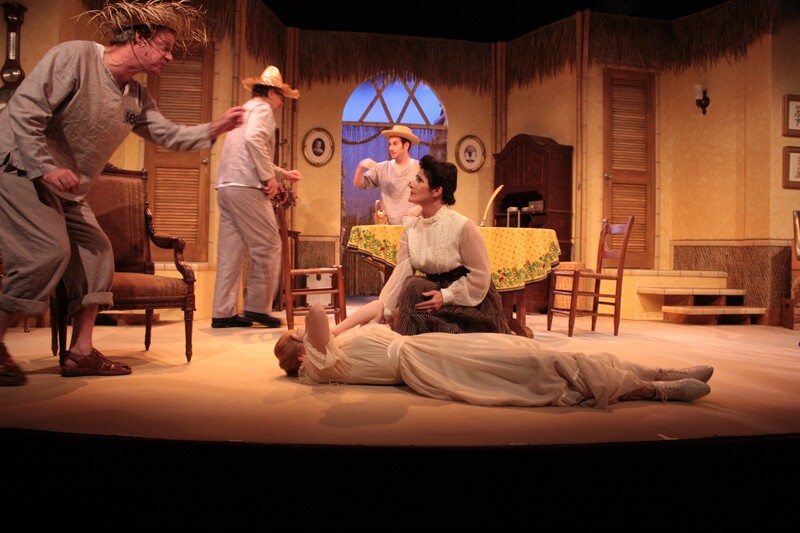 This bent fairy tale unfolds on James Ewing and Diana Marbury’s charming turn-of-the-last-century tropical set.